I recently helped a member find an alternate source for a Death Notice in the digital archive of the National Library of Australia, more commonly called TROVE. They have digitized and indexed more than one-thousand titles. The Advanced Search screen provides many options for narrowing the results in case the names you are searching for make it difficult (think Smith, Wood, Swan, etc). The abstract is not necessary because this record does not require a paid subscription. It can, however, save you and others time when looking for clues. Always review the original if you can for items which were not included. In this case, I did not include the home address of the parents (clues for distinguishing between two people of the same name), nor the notation that he was privately interred. Welcome back, Sarah. Happy Sourcing! Congrats, Sarah, on sourcing the most this week. 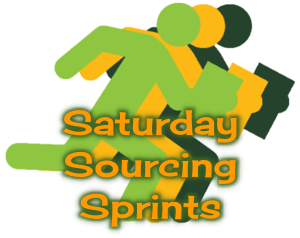 Ready, set, Saturday Sourcing Sprint, go! LOL and they are blessed to have a champion in you. Also, Trove is one of the most addictive places for Australian geneaologists on the internet...it's a very deep black hole that easily steals hours of your time when you weren't intending it! I've loved the few times I worked with the Trove databases. I need to remember to do it more, even when I'm not looking for people from Australia. I keep forgetting that they have digitized papers from all over the world. How was the citation? Look like what you would have used? LOL I used to use the simpler style of citations until that one time when I had to search a page to find the article that I had cited. It was a page much like that one I linked above and I wanted to review it to see if it had any more information. I had cited it as the source for an estimated death date on a parent's profile because the Death notice said "was predeceased by her parents." The problem was, the couple had six daughters that had married and I hadn't noted who had died. I had to do a separate search for each married surname. That's when I started including who the item was about and where on the page it was located. Snowy day. Should be able to find a few sources. Stay warm, Beverly, and Thanks! Finally I have a Saturday where I didn't sleep all day! I'll use the tracker. Good morning, Bright Eyes. Good luck this week, Lucy!